Well, its happened. I can't remember if I've shared this photo before or not. If so, please forgive me. This is a portion of a fence in a neighbor's front yard. Some long-time residents say the fence portion is all that's left of a former fence or gate. Others say it was salvaged from another site. 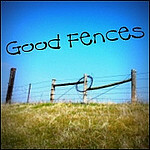 Linking up with Theresa's Good Fences. makes for an interesting marker! thanks, karen! Clever reusage of the fencing. It's a good conversation piece then. And quite attractive. Wow, it's new to me, and I like how lovely and interesting it is. It is interesting, wherever it came from. I'm sure many people hadn't seen it (including me) if you did post before, so no "biggie"! :-) Nice entryway to a neighborhood! Thanks for coming by my quilting blog and commenting on the Tucson quilt show! I haven't seen this before. It is an interesting fence feature.